Maintaining your child’s dental health and overall well-being is as important before he or she is born as it is during their first year of life. To ensure that your child is receiving the highest level of baby teeth care in Johns Creek, GA, your ideal choice is to work closely with the leading experts from Children’s Dental Zone. The following are essential steps that must be taken before birth as well as up to your child’s first birthday. The American Academy of Pediatric Dentistry (AAPD) recommends that all pregnant women obtain dental health care throughout their pregnancy. Research has linked periodontal disease with preterm birth and low birth weight. In addition, mothers with poor dental health could be at a higher risk of passing bacteria that causes cavities to their children. We recommend speaking with your doctor or dentist on ways you can prevent or treat periodontal disease during pregnancy. There are many things that can be done to help decrease this risk, such as regular visits to your dentist, daily brushing and flossing, a healthy diet that is low in sugars and starches, choosing a toothpaste with fluoride, and rinsing daily with an alcohol-free rinse. Never share eating utensils or other items that can transmit bacteria to your children. If you chew gum, choose something with xylitol, as this can decrease your and your children’s caries rate. 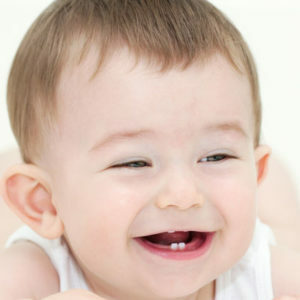 When babies are born, they typically have around 20 teeth partly formed inside the gums. The front two – lower first and then upper – are the first to erupt between 6-12 months of age. By age 3, most kids have a set of fully functional 20 primary teeth in their mouths. To ensure proper dental health, the American Dental Association recommends scheduling your child’s first appointment between the arrival of their first tooth and first birthday. Early childhood caries (cavities) is also referred to as “baby bottle tooth decay.” This is a serious condition that is a result of lengthy exposure of your infant’s teeth to liquids that contain sugar. These liquids can include milk, breast milk, formula, juice and any other sweetened drinks. Putting your infant to sleep, whether for a nap or bedtime, with a bottle containing anything other than water can result in severe and rapid tooth decay. The sugar pools around the teeth give plaque a chance to produce acid that attacks their tooth enamel. It can be difficult to put a baby to bed without a bottle to comfort them, and thus we recommend only using water. If needed, gradually dilute their normal drink of choice with water over several weeks until it only contains water. Additionally, after each nighttime feeding, wipe your child’s gums and teeth with a damp washcloth to remove the plaque. Sippy cups are recommended as a training tool to help your child transition from a bottle to a cup, and should no longer be necessary after their first birthday. If your child continues to use a sippy cup throughout the day, fill it with water only at any time outside of meals. The prolonged period of exposure to liquids containing sugars through sippy cups will increase the cavity-causing bacteria in your child’s mouth. To learn more about baby teeth care in Johns Creek, GA, please do not hesitate to contact us at Children’s Dental Zone today!